Articular cartilage injuries do not self-repair easily. Luckily, there is new advanced technology that can be used for a wide variety of injuries and orthopedic problems to repair damaged cartilage and reduce permanent disability in the patient. The most advanced cartilage repair techniques is the articular chondrocyte implantation (ACI), which leads to a normally functioning articular cartilage and provides the stability to the joint. Articular cartilage is made of hyaline cartilage, and this covers the bone ends and joint surfaces. The main function of this cartilage is to allow smooth motion between the two articular surfaces and provide a surface that will allow weight-bearing, distribution of weight, and shock absorption. The number of athletes and adults that acquire joint injuries grows every year, so repairing articular cartilage damage is a focus of many orthopedic specialists. Damage to this cartilage occurs from ligament instability, severe trauma, leg mal-alignment, overuse, osteochondritis, and/or a meniscectomy (removal of the meniscus). Cartilage defects occur mainly as the result of a twisting injury while under a full load of weight. They also occur from a fall or direct blow to the knee, often in sporting accident. The symptoms of damage often occur immediately, but can be delayed for several days or weeks following the injury. When the articular surface is damaged and this is not treated, increasing cartilage degeneration occurs along with osteoarthritis. Right after the injury, most people will immediately feel an acute stabbing pain and experience swelling for 12 to 24 hours. During the first few days, putting weight on the leg will cause knee pain, and “giving way” or knee locking is commonplace. With the swelling, there is damage to internal ligaments, such as the anterior cruciate ligament (ACL). To assess the injury and diagnose cartilage problems, the orthopedic specialist will do a thorough examination and order specific tests. Magnetic resonance imaging (MRI) is useful for diagnosing cartilage injuries, mainly because it gives a visualization of the soft tissues and surface of the cartilage. 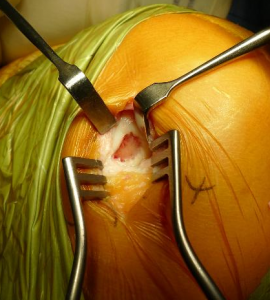 During the last 50 years, there has been much advancement in cartilage repair. The effective technique of ACI has emerged as an effective treatment for restoration of normal joint function. The goal of ACI is to allow hyaline cartilage to regenerate on its own. There are two separate surgical procedures involved with the ACI technique. The first is an outpatient surgery done by a minimally invasive arthroscopic evaluation of the knee. During this, the damaged articular surface is removed from the area that is non-weight bearing so the cells can be cultured in a laboratory. This tissue is cryo-preserved until surgery. 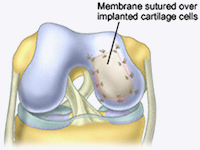 During the second procedure, the surgeon clears the damaged cartilage and implants the cultured chondrocytes. This is usually done by injecting cells under the collagen membrane, which is sutured onto the affected region. This allows the cells to grow inside the joint and form into solid cartilage tissue. Following the procedure, the patient is in a rehabilitation program with physical therapy. 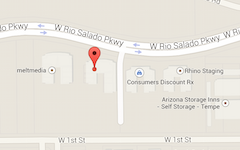 The length of recovery time depends on the location of the implant and the severity of the damage that was repaired. The ACI procedure is successful for approximately 90 percent of patients, and results last for up to 10 years.